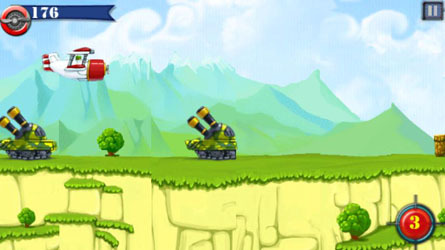 Rule the sky and defend your land by flying through the endless enemies that show up across the country. This is an interesting little mini Android game that’ll keep you occupied for those short 5 minute breaks where you’re looking for a breather. It’s achievements and competitive points feeling make it playable, but unfortunately its slightly weak in the overall finish. 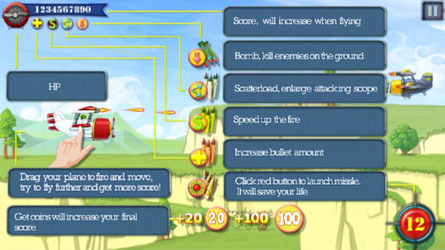 Gameplay: Fly Boy is a 2-D flying shooter where you pilot a plane as far as possible. During your flight you’ll be shooting anything that moves whilst dodging bullets, missiles and bombs that are sent your way. Where your finger touches the screen will determine the plane’s position and whilst your finger is on the screen your guns will automatically fire. Ace points: The game is pretty easy to understand, and is good to pick up and play for a few minutes. The graphics are quite neat and consistent, and the interface is fairly responsive. There is decent music and sound effects which help you feel like you’re in a 1950s fighter plane. I like my mindless shooters so I enjoyed this game initially and the achievements which popped up spurred me on to keep playing. In fact, I played the game to the point where my thumb felt like it hurt and was gonna get a blister. Though to be honest I think that’s my weak thumb skin more than a claim for a great game. Verdict: 2/5 It has rather good potential and the right ingredients for a good 5 min game. You’ll play it over a week or two and within that time you should complete the majority of the achievements and you’ll get a decent high score. There’s weird vertical flying movement sometimes, so you move up faster than you move down, or vice-versa. I think it could be some realism built in, but whatever it is, it’s annoying and feels like a bug. The sound effects are slightly imbalanced, and the sound of a bomber man dying is quite over-bearing. It confuses you because you feel like you’ve been hit. The damage inflicted by different weapons is different – for instance, gun shots can cause way more damage than missiles and mortars. I can only think that this may be because the guns get direct shots onto the pilot… but hey, missiles can obliterate planes in reality! In short, there’s some inconsistencies in the game which distract you from enjoying this fully. Primarily it’s the interface which I’ve got quarms about. Having said that, the leader board indicates that some players are surviving for a very long time (mainly Chinese Android players!). I think Fly Boy is an Android Game that’s well worth trying though – see if it’s for you! The trick here is to focus primarily on survival, because the longer you’re alive then the more chance you have of getting achievements or getting a higher score. Always fly to collect the power ups. In fact, you’re pretty much flying to collect the super auto fires, and health packs. You should be able to naturally pick up the multi-directional guns and the missiles. Don’t be too greedy to collect all the coins/points – although they add to your score, they’re not worth it if you’re gonna take damage or be in compromising situations. If you have an HTC Desire, then remember that multi-touch is an issue, so let go of the plane movement when you press the missiles button.